Episode 049 FAMILY - Jackie Kashian: "Be a whole person" – Let's Talk About Sets! Episode 049 FAMILY - Jackie Kashian: "Be a whole person"
The hilarious and legendary Jackie Kashian joined us to talk about FAMILY in stand-up comedy. Everyone has a family, and everyone has family dysfunction, so this topic is one of the most fundamental, relatable, and powerful elements of stand-up. By its nature, making jokes about one’s roots involves talking about the problems, the disappointments, and the tragedies. But how do you make fun of your family without ruining your relationships? When does it work, and when doesn’t it? Some comedians use an fictional version of their spouse or their parents, but much of Jackie’s best material is about her family in a very real and specific way. How does she do it, and how does she do it so well? We sifted through her vast published work to find our favorite bits of hers on family, and she generously shared the details of what really happened in her family life and how she so masterfully adapted that to her act. We couldn’t be more grateful! Jackie Kashian has been doing comedy for 33 years! We found her to be an absolute delight, showering us with tips on how to navigate the stand-up industry and making us laugh with her quick and gentle wit. In addition to solo headlining around the country, she regularly performs with Brian Regan and her good friend, Maria Bamford. 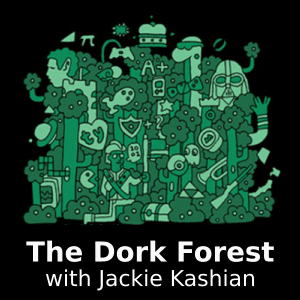 Jackie is the creator and host of one of the longest and most successful podcasts around, The Dork Forest, where she talks with people about what they love to do, think about, and collect. In addition to her four albums, she has multiple late night appearances under her belt and an impressive acting resume. Her current album, I Am Not The Hero Of This Story, was #1 comedy album on iTunes and Amazon and is critically acclaimed. She also has a podcast with Laurie Kilmartin where they complain and celebrate stand-up comedy. 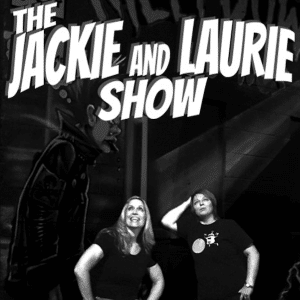 It is called The Jackie and Laurie Show. And a huge thanks to to our guest, Jackie Kashian! Oh Salt N’ Peppa, the sun rises and sets in your collective eyes.